Based on a popular New York Times Op-Ed piece, this is the quirky, heartfelt account of one man's quest to meet his neighbors--and find a sense of community. **As seen in Parade, USA Today, The Washington Post, The Chicago Sun-Times, and more. **Winner of the Zocalo Square Book Prize, and recently named a first selection by Action Book Club. "It's impossible to read this book without feeling the urge to knock on neighbors' doors." Journalist and author Peter Lovenheim lived on the same street in suburban Rochester, NY, most of his life. But it was only after a brutal murder-suicide rocked the community that he was struck by a fact of modern life in this comfortable enclave: No one knew anyone else. Thus begins Peter's search to meet and get to know his neighbors. An inquisitive person, he does more than just introduce himself. He asks, ever so politely, if he can sleep over. In this smart, engaging, and deeply felt book, Lovenheim takes readers inside the homes, minds, and hearts of his neighbors and asks a thought-provoking question: Do neighborhoods matter--and is something lost when we live among strangers? Peter Lovenheim is a journalist whose articles and essays have appeared in the New York Times, USA Today, New York magazine, and other publications. He teaches writing at Rochester Institute of Technology and is also the author of Portrait of a Burger as a Young Calf, a firsthand attempt to understand the food chain, and other books. He lives in Brighton, New York, a suburb of Rochester. "The people Lovenheim meets have great backstories, and his life is enriched by his efforts. It's impossible to read this book without feeling the urge to knock on neighbors' doors." "A disarmingly straightforward approach to its subject...Lovenheim does his modest best to create neighborly bonds where none existed, with quiet but real results." 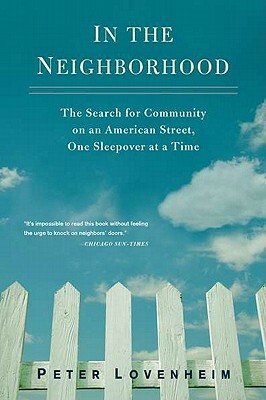 "It is hard to read this book and not think of your own neighborhood, your own street. Who do you know? Everyone? Anyone? No one at all?" "This book, so gentle and unassuming on the surface, is in fact deeply radical. If we all took its lessons to heart, our world would be a different, and better, place." "The appeal of In the Neighborhood is hard to resist, and Lovenheim's interactions with his own neighbours are always interesting...."
"Lovenheim advances ideas about isolation in the modern world, and why a welcoming front porch is needed now more than ever." "Mr. Lovenheim's 'neighborhood' is a place where no one knows anyone else-like so many neighborhoods today. In this warm and intimate book, he gets to know the strangers who are his neighbors and shows how a community can be transformed by the power of human connections." "In the Neighborhood is a big book in sheep's clothing: it insists on posing the boldest questions about our everyday American lives, but does so personably and mildly. We accompany this insistently wide-eyed author on a series of neighborhood sleepovers, and come face to face with our own insularity." "This book will awaken your inner sociologist. In the Neighborhood is an inspirational reminder that for all our collective bemoaning about the loss of community, the solution is only a knock on the door away."